You can reveal this card in your hand; your opponent randomly chooses 1 card from your entire hand, then you discard the chosen card. Then, if the discarded card was not “Danger?! Jackalope?”, Special Summon 1 “Danger!? Jackalope?” from your hand, and if you do, draw 1 card. If this card is discarded: You can Special Summon 1 “Danger!” monster from your Deck in Defense Position, except “Danger?! Jackalope?”. You can only use this effect of “Danger!? Jackalope?” once per turn. Danger!? Jackalope? Is my fiancee’s personal favorite of the Danger! archetype. Strong DEF, Jackalope is the floating deck searching member of the archetype. With all “Danger!” monsters no matter what you are going to have a bad time with which card you choose. Discard Jackalope, it’ll Special Summon a different “Danger!” from the deck in defense. Those monsters can get used for Link or Xyz Summons. If Jackalope doesn’t get chosen, it gets Special Summoned. If you need to wall up during your opponents turn (like using Danger! Zone) you can get a big defender like Nessie to protect yourself. Speed is key for the archetype, and Jackalope is what gets you your Danger! monsters. Danger! monsters live up to their name. No matter the choice, it could get bad very quickly. Danger! Jackalope? is a Level 3 Dark Beast-type monster with 500 Atk and 2000 Def. All 4 of these Danger! monsters have about the same effect. They have to reveal themselves from the hand to make your opponent discard a random card from your hand. If it has the same name as the revealed card, then the discard effect applies once per turn. If not, you can Special Summon the named card, in this case Jackalope? would be Special Summoned and you draw 1 card. Jackalope?’s discard effect is to Special Summon any other Danger! monster from the deck in Def position. So the stats don’t matter and the effect is about as good as any of the Danger! monsters. Running 2 of this seems like a good idea, but really there isn’t much choice because of the limited card pool for the archetype. Level 3 and Beast does have good support, so this one could be splashed into a different deck to try to get the draw and a 2000 defender. Try it out, the worst it could do is run away. Looks like now we are looking at the Danger! monsters of the theme, which there are four of, but we will only look at two this week with Throwback Thursday not having a real Danger! card to look at. Today we will look at Danger!? Jackalope? Jackalope? is a Level 3 DARK Beast with 500 ATK and 2000 DEF. ATK is poor, but it makes up for that in DEF. DARK is a great attribute and being a Level 3 Beast gives synergy with Rescue Cat. You can reveal Jackalope? in your hand and then put it back, then your opponent will randomly discard a card in your hand and if they don’t discard a Jackalope? you can summon Jackalope? from your hand and draw 1 card. All of the current Danger! monsters are like this only instead of Jackalope? it would be for the corresponding Danger!, so for future Danger! monster reviews I will call this the Danger! effect. So it is based on probability, but if you have 5 cards in your hand and only 1 is Jackalope?, you have a 80% chance of them missing the Jackalope? so these Danger! monsters are more likely getting summoned when your hand size is bigger. It is a nice summoning condition that is easy to fulfill and again, the bigger your hand the more unlikely your opponent is to discard the Danger! you reveal. If Jackalope? is discarded by any means, including its own effect, you can summon a Danger! from your deck in Defense Position. The best one might be Nessie! with its 2800 DEF, but you might also want to draw that cause when it is discarded you get to search, but still getting any monster from the deck to the field is good. Jackalope? is a good card for the archetype that is worthy of being run in any Danger! variant since it is unlikely it’ll be dead if discarded. Art: 4.5/5 Not really dangerous, but it is cute. Tomorrow is Throwback Thursday and Friday (you can likely guess which Danger! Monster I chose for that) but I chose Jackalope today because he’s a little different, has the coolest art of the three remaining…that’s about it. Danger!? (how much Danger! is a Jackalope) Jackalope? is a Level 3, Dark, Beast Monster, with 500 attack (blah) but 2000 defense makes us happy. So, as pertains to the theme, you reveal this card in your Hand, and your opponent chooses one card from your Hand at random, which you then Discard. If the Discarded card was not this card, you Special Summon Danger!? Jackalope? from your Hand. If you do, you’re than granted to Draw a card. Drawing is always good, so that evolved into a +2 for you (this new Monster on your Field, as well as the Draw). This card also can give you advantage if discarded, as if it is (no specification as to how or by whom, again, note the Dark World parallels) you get to Special Summon a Danger! Monster from your Deck in Defense Position. (Remember, too, Bigfoot has 0 defense to go with that 3000 attack) Nessie is probably who you’re going for with this (2800 defense on her) or even perhaps another Jackalope. 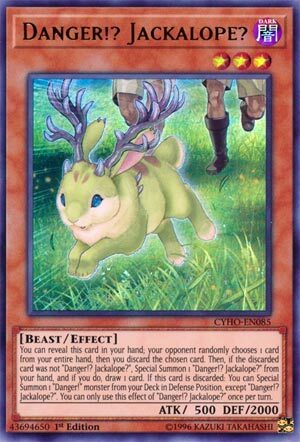 This little Jackalope is a key part to the Deck, for cycling, Drawing, and speed, as well as potentially and likely bringing out something else (again, likely Nessie) so, this critter is a 2, or even 3 at the time in the Deck, given the small amount of Monsters (there are just the four).